Some areas of northern Nigeria still do not have consistent access to healthcare. This is mainly due to the lack of health facilities in remote areas, and the inability of local populations to access transportation to functioning primary healthcare centers. Health Camps (HC), a demand-creation intervention, was birthed to fill this gap by working with government partners to supplement monthly polio vaccination campaigns (Immunization Plus Days) with essential medicines. It also serves as a means to address persistent cases of refusal of polio vaccines by heads of households. Funded by the Bill & Melinda Gates Foundation, eHealth Africa (eHA) has supported the Kano State Ministry of Health as an implementing partner. We procure, package and distribute medications across the 44 Local Government Areas (LGA) in the State. By the end of 2016, eHA had distributed 82,452 HC boxes across over 27,000 settlements in Kano; up from 34,188 HC boxes delivered in 2014. In September 2016, to ensure that the National Guidelines of Malaria testing before treatment were met, Rapid Diagnostics Test (RDT) Kits were introduced to the HC boxes. RDTs permit a rapid, accurate, and accessible detection of malaria parasites, particularly in remote areas with limited access to health facilities. This exercise has promoted a more rational use of increasingly costly drugs, through enabling health workers to distinguish between fevers caused by malaria parasites from those caused by other illnesses. — Dr. Kabir Ibrahim Getso, Commissioner For Health, Kano State. Each HC box contains supplies for 100 people. 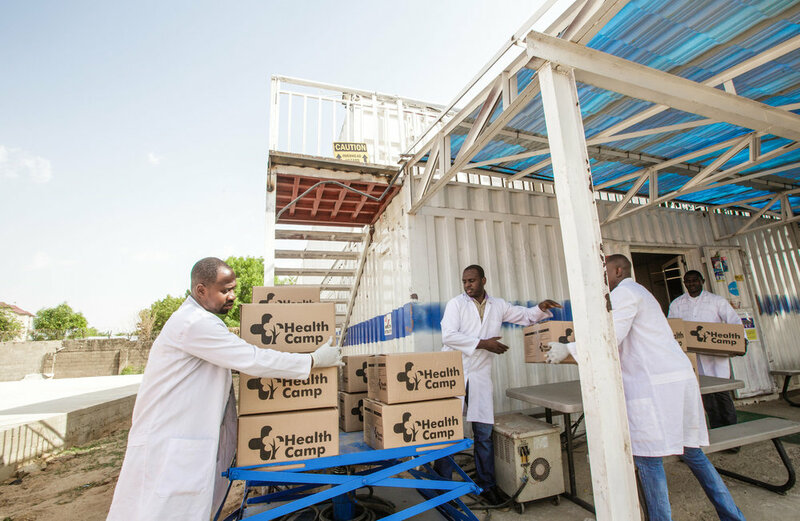 These supplies include RDTs, and medicines to treat malaria, tapeworms, ulcers, diarrhea, scabies, and other diseases. Trained community health workers administer RDTs for malaria and prescribe corresponding medications. In cases where the diagnosis are advanced, the beneficiaries are referred to the nearest health center. eHA procures and packages over 2,000 HC boxes for every Immunization Plus Day (IPD) campaign. Since 2014, over 5 million people have benefited from HCs; including 2.2 million children under the age of 5. This initiative has also seen 3.6 million cases of malaria diagnosed and treated, which is around 70 percent of total patients serviced since inception. After more than two years without wild poliovirus in Nigeria, the Government reported in August 2016 that 2 children had been paralyzed by the disease in the northern Borno state. The cases highlighted the need to prioritize immunization of children particularly, in hard-to-reach areas in northern Nigeria. In the last quarter (Oct. Dec.) of 2016 alone, over 480 thousand children were Immunized with Oral Polio Vaccines (OPV) at HCs. The significant progress and achievements in the past couple of years, have been due to the high level of political commitment and leadership. Traditional community leaders have also provided credibility to the project by openly promoting and encouraging community members to attend HCs. — Alhaji Ja’afaru Ahmed Gwarzo, Sarkin Tsafta, Kano Emirate Council.